Italy's president has resigned as he indicated he would on New Year's Day. Napolitano was the longest serving Italian president. He served longer than he intended, but Italian politics are messy, and the continuity, he offered was important. He has been president through five different governments and two elections. The last three prime ministers, including Renzi were not elected. 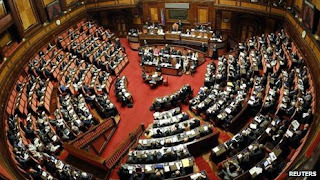 The Italian president is selected by an "electoral college" that is composed of both members of parliament and 58 regional delegates. A secret ballot is used, and this allows much intrigue. They will meet on January 29th to begin the process. It can last several days. There are 1009 delegates. The first three rounds require a 2/3 majority to elect the president. With the fourth round, only an absolute majority is needed. A maximum of two rounds is permitted a day. Prime Minister Renzi's may count on 415 electors from his from parliament, not including the regional delegates which have not been selected yet. And that assumes that he can count on his entire party for support, which may be a bit of an assumption, given that the party itself is a coalition of disparate political views. This means that in order to find a candidate that can win in the first three rounds, Renzi will have to reach out to one of the two main opposition parties: Forza Italia, led by Berlusconi (130 delegates) and Five-Star, led by Grillo (137 delegates). A deal with Berlusconi seems marginally more likely, but it will come with at a price (of course). Renzi's strategy may be to look for a victory in the fourth round or a subsequent round that he needs only a simple majority. The majority Renzi relies on to pass legislation draws support from the New Center-Right (spin off from Berlusconi), and Civic Choice (led by former PM Monti). Again, this would assume no defections. Speculation is swirling around a number of candidates. They include former PM Prodi and Bank of Italy Governor Visco. Some, like myself, had previously suggested that ECB President Draghi would be an interesting candidate, but, frankly, this is not very likely now. Some have thought Defense Minister Pinotti would be a suitable candidate, but she does not seem particularly likely either. Renzi needs a strong candidate, but not too strong that would overshadow him or resist his reform efforts. He needs a candidate that could bring together the disparate and fragmented political forces. This is a tall bill to fill. There is some risk that the trade-off will be to slow further Renzi's reform efforts. Unlike in Greece, the Italian presidential selection process is unlikely to result in a national election. That said, many observers fear the consequences of an Italian election for the stability of the eurozone more than the Greek election. 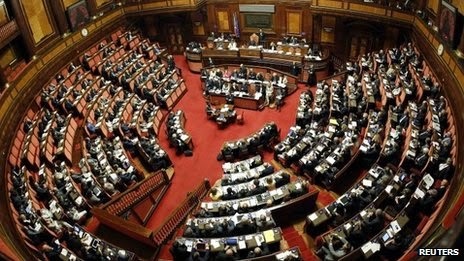 The two main opposition parties in Italy favor withdrawing from EMU.